The Fort Scott Area Chamber of Commerce presents the 15th Annual Forks & Corks tasting event of the year! 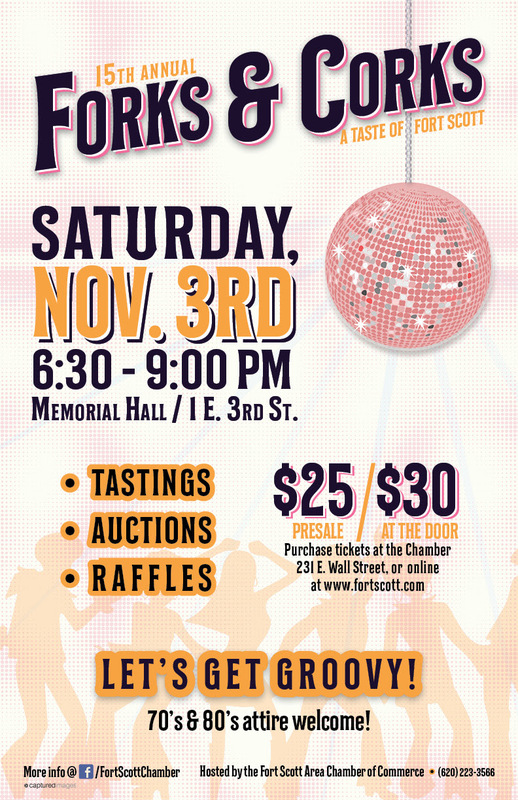 Come out SATURDAY, NOVEMBER 3rd for a great night of tastings, auctions, raffles and more! The Fort Scott Area Chamber of Commerce invites you to attend the 15th Annual Forks & Corks event. Forks & Corks is one of the most popular events among Fort Scott locals and visitors! Forks & Corks is one of three primary fundraisers the Chamber hosts annually to benefit our mission to support business, build community, and promote spirit. This is a tasting event where Fort Scott restaurants and caterers are invited to share tasting of several of their popular items. Standard Beverage will be present to provide tasting of numerous wines, beers and liqueurs. Awards will be presented, and the evening will end with a silent and live auction. Please contact the Chamber at (620)223-3566 if you have any questions. Tickets to this event are available for purchase at the Chamber – 231 E. Wall St. (open Saturday until 4pm) or at the door of the event.